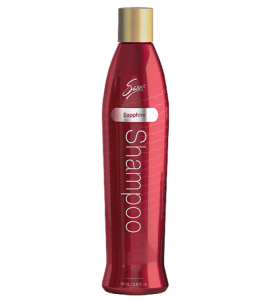 Sisel Sapphire Shampoo was created utilizing special super-fruit blends that help structure and support long, colored or damaged hair. Sisel Sapphire Shampoo has a unique array of super-fruit blends that contain a collection of powerful antioxidants that help repair damaged hair and hair follicles, and reconstruct long damaged hair, making hair smoother, softer, and easier to comb. The unique structure of this shampoo creates a luxurious product that will not disappoint. Free from sulfates, parabens, and other potentially harmful ingredients, Sisel Sapphire is the Sisel Safe® way to bring volume and a healthy look back to your hair.